A Beautiful Ruckus: 10 Great Toddler Books for Fall! 10 Great Toddler Books for Fall! My favorite season deserves to be celebrated with food, fun, and of course, books! I think I currently have close to 100 books checked out from our library between what I'm reading and what the kids are enjoying. Sean has his own stack checked out on his card. Since books are such an important part of our family, we thought we would share with you: 10 Great Toddler Books for Fall! A fun book about Sally and her dog, Sam, as they explore the outdoors during fall. The words "blow" across the pages as they jump in leaves, eat pumpkin pie, and visit the fair. The illustrations are as lively as the text, and manage to keep a whimsical flair while still keeping objects easily recognizable. Doggies are a huge favorite at our house right now, so any book that has a dog in it is a clear winner! The Nutbrown Hares books are classics! This is a sweet story about Big Nutbrown Hare and Little Nutbrown Hare enjoying an autumn day. When Big Nutbrown Hare gets too tired to play, Little Nutbrown Hare wanders off and finds a box. He then comes back and pretends like he is a monster. Big Nutbrown Hare plays along and then chases his child continuing their day of fun. Confession, I knew this book would make the list when I saw that it had "Suzy and Friends" illustrations. I've always loved her kid-friendly animal drawings! In this book, Suzy and Emily who are best friends, are anxiously waiting to jump in a pile of leaves so that they can officially welcome fall. The only problem is that the leaves haven't fallen yet! The two friends put their heads together and come up with a series of ways to try to get the leaves to fall to the ground. Follow their antics as they encourage fall to arrive! This book has two stories in it: The Falling Leaves and The Perfect Pumpkin. Max and Maggie are best friends who make quite the team. In The Falling Leaves, Maggie heads over to Max's house to help him rake his leaves, but it seems Max has other plans for his leaves. In The Perfect Pumpkin, Maggie tries to help Max find a pumpkin, but Max turns down every pumpkin she suggests. Maggie ends up frustrated and leaves the pumpkin patch, while Max tries to figure out how to make it up to her. A little later, he shows up at her house with a special gift. We are still learning to identify letters at our house, and this book is the perfect autumn-esque way to encourage that! Wargin does a marvelous job coming up with a fall-inspired rhyme for each letter of the alphabet while reinforcing with every page that autumn and everything we love about it are special blessings from God. Bright colors make this book very visually appealing for little ones. The book goes through all of the different types of people who love the autumn months, including leaf rakers, corn-crop reapers, and taffy lickers. It's a fun approach to appreciating fall! This adorable book is about a rabbit and his mother. She insists they go for an autumn walk even though Small Rabbit doesn't want to. Once they get outside, the wind keeps whipping Big Rabbit's words away, and Small Rabbit thinks he hears her telling him to do something else. He gets into all sorts of mischief as his mom tries to keep up with him. They end up back at home after a wonderful time playing outside. Set to the rhythm of "London Bridges Falling Down," this book teaches all of the different types of leaves and what colors they turn in the fall. It would be neat to read this book and then head out on a nature walk to practice identifying leaves! Another book with wonderful, bright illustrations! Exploring types of leaves along with all of the different activities that can be done with fall leaves, this book does a great job of inspiring a lots of outdoor fall activities. In a panic, Pip Squirrel suddenly realizes that his tree home is losing its leaves! He races around trying to put them back, and when his sister sees him, she tries to help as well. But no matter how hard they try, they can't get the leaves to stick back on the tree. Then their Mom shows up and explains that the tree has been taking care of its leaves all summer and needs a little break. But then encourages the little squirrels by letting them know that the leaves will come back. 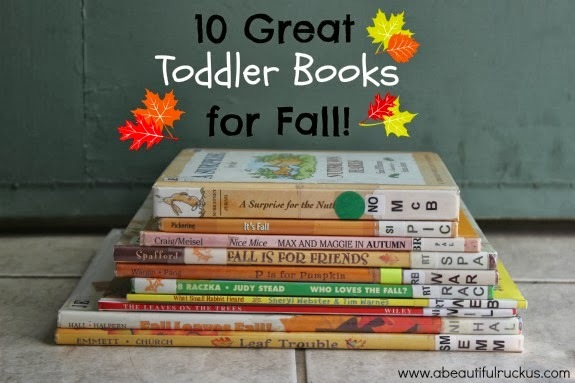 What are your favorite toddler books for fall? Share in the comments below! We are always looking for new book ideas!